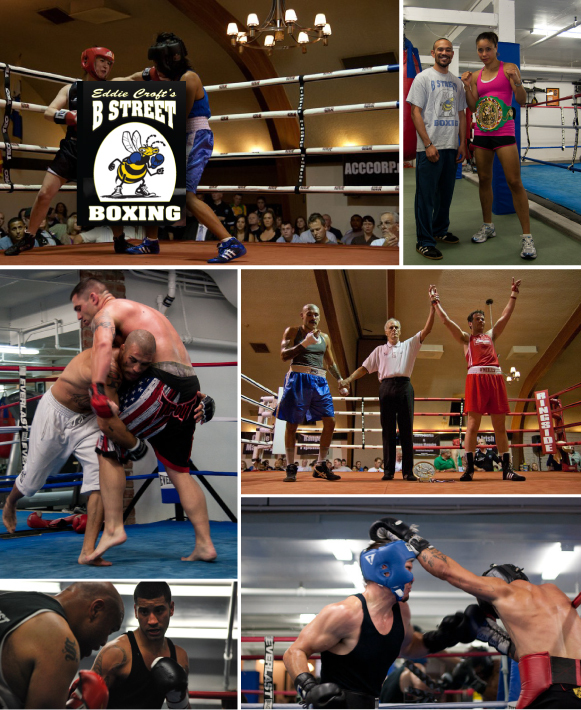 B Street Boxing is two-fold: to teach children,teens, and adults the technique and skills of boxing and mixed-martial arts, while infusing them with the discipline and dedication required to achieve a high level of success in these types of fitness and competition. Despite his individual success as a fierce competitor, Croft's proudest achievements come as a trainer and teacher. He trained a professional World Kickboxing Champion, five San Francisco Golden Glove Champions, and many others in various disciplines of combat sports. Due to the wealth and variety of his knowledge, he has set a new goal: to become the first, and possibly the only person to train a boxing, kickboxing and mixed-martial arts champion. Eddie is certified by USA Boxing as a Level II coach and licensed by the California State Athletic Commission both a coach and a manager. Additionally, Eddie Croft has taught multiple self-defense workshops. Eddie received his black belt in Tae Kwon Do at eleven years old and is now a third degree black belt in Tae Kwon Do. He was also a part-owner of Golden State Tae Kwon Do and Undisputed Boxing Gym.